Lanzarote Holidays Free Child Places 2019 - @Web2travelDeals. Lanzarote Holidays Free Child Places 2019 @Web2traveldeals. Online Since 2000. Finding the Best Value Lanzarote Holidays Free Child Places 2019 from U.K. airports. Popular resorts include Costa Teguise, Matagorda, Playa Blanca, Playa De Los Pocillos, Puerto Calero, Puerto Del Carmen. Stop wasting time checking website after website, looking for Lanzarote Holidays Free Child Places 2019, only to find that the deal advertised has expired or does not exist. We understand from reading online reviews, how frustrating it can be for you, when searching for hours for Family Holidays Lanzarote, only to find that the headline deals advertised are only available in May or September or twice the price during the School Holidays. Lanzarote Holidays @Web2travelDeals is designed to save you time and money when searching for Free Child Places Lanzarote 2019. We regularly check with Top Tour Operators to find out which Lanzarote resorts have holidays from the UK to Lanzarote with Free Child Places School Holidays. This post Lanzarote Holidays Free Child Places 2019 shows you hotels and apartments which our team have visited to check that free child places were available during School Holidays, on the date that this post was updated. Many Tour Operators have now released their Free Child Places for Summer 2019. To save you time, we have already found the Best Offers for Lanzarote Hotels and Apartments with Free Child Places Summer 2019 below. As an affiliate publisher, Web2move may receive a small commission from Tour Operators for bookings made using the links below, should you decide to book a holiday. The prices shown are taken from Tour Operator websites on the date this post is updated, and are shown as a guide only. Actual prices will be confirmed on the individual Tour Operators website, at the time of booking. Free Child Places are limited and may be Sold Out or Withdrawn at any time. We suggest that you book your holiday on the day that you find a Free Child Place as experience has shown that they are often not available, when you revisit the website. Galeon Playa Apartments & Aquapark Costa Teguise, Costa Teguise, Lanzarote, 3 star. Get More Information and claim your Free Child Place for Galeon Playa Apartments & Aquapark Costa Teguise, Costa Teguise, Lanzarote. Free Child Places may also be available from other Airports on alternative departure dates. Santa Rosa Apartments, Costa Teguise, Lanzarote, 3 star. Get More Information and claim your Free Child Place for Santa Rosa Apartments, Costa Teguise, Lanzarote. Sands Beach Resort, Costa Teguise, Lanzarote, 3 star. Get More Information and claim your Free Child Place for for Sands Beach Resort, Costa Teguise, Lanzarote. Hotel Beatriz Costa Teguise & Spa, Costa Teguise, Lanzarote. Get More Information and claim your Free Child Place for Hotel Beatriz Costa Teguise & Spa. H10 Suites Lanzarote Gardens, Costa Teguise, Lanzarote. Get More Information and claim your Free Child Place for H10 Suites Lanzarote Gardens. El Trebol, Costa Teguise, Lanzarote. Get More Information and claim your Free Child Place for El Trebol. THe Mirador Papagayo, Playa Blanca, Lanzarote. Get More Information and claim your Free Child Place for THe Mirador Papagayo, Playa Blanca, Lanzarote. THB Tropical Island, Playa Blanca, Lanzarote. Get More Information and claim your Free Child Place for THB Tropical Island, Playa Blanca, Lanzarote. Villas Kamezi, Playa Blanca, Lanzarote. Get More Information and claim your Free Child Place for Villas Kamezi, Playa Blanca, Lanzarote. LABRANDA Suite Hotel Alyssa, Playa Blanca, Lanzarote. Get More Information and claim your Free Child Place for LABRANDA Suite Hotel Alyssa, Playa Blanca, Lanzarote. Iberostar Lanzarote Park, Playa Blanca, Lanzarote. Get More Information and claim your Free Child Place for. THe Volcan Lanzarote, Playa Blanca, Lanzarote. Get More Information and claim your Free Child Place for THe Volcan Lanzarote, Playa Blanca, Lanzarote. Hotel Hesperia Lanzarote, Puerto Calero, Lanzarote. Get More Information and claim your Free Child Place for Hotel Hesperia Lanzarote, Puerto Calero, Lanzarote. THe Oasis Apartments, Puerto Del Carmen, Lanzarote. Get More Information and claim your Free Child Place for He Oasis Apartments, Puerto Del Carmen, Lanzarote. Jable Bermudas Apartments, Puerto Del Carmen, Lanzarote. Get More Information and claim your Free Child Place for Jable Bermudas Apartments, Puerto Del Carmen, Lanzarote. Puerto Carmen Aparthotel, Puerto Del Carmen, Lanzarote. Get More Information and claim your Free Child Place for Puerto Carmen Aparthotel, Puerto Del Carmen. Lomo Blanco Apartments, Puerto Del Carmen, Lanzarote. Get More Information and claim your Free Child Place for Lomo Blanco Apartments, Puerto Del Carmen, Lanzarote. Bitacora Lanzarote Club, Puerto Del Carmen, Lanzarote. Book Your Package Holiday Online Now direct with Top Tour Operator to claim your Free Child Place Bitacora Lanzarote Club, Puerto Del Carmen, Lanzarote. LABRANDA Playa Club Apartments, Puerto Del Carmen, Lanzarote. Get More Information and claim your Free Child Place for LABRANDA Playa Club Apartments, Puerto Del Carmen, Lanzarote. Nautilus Lanzarote, Puerto Del Carmen, Lanzarote. Get More Information and claim your Free Child Place for Nautilus Lanzarote, Puerto Del Carmen, Lanzarote. Gloria Izaro Club Hotel, Puerto Del Carmen, Lanzarote. Get More Information and claim your Free Child Place for Gloria Izaro Club Hotel, Puerto Del Carmen, Lanzarote. Aqua Suites Boutique Hotel, Puerto Del Carmen, Lanzarote. Get More Information and claim your Free Child Place for Aqua Suites Boutique Hotel, Puerto Del Carmen, Lanzarote. Aparthotel Costa Mar, Playa De Los Pocillos, Lanzarote. Get More Information and claim your Free Child Place for Aparthotel Costa Mar, Playa De Los Pocillos, Lanzarote. Hyde Park Lane Bungalows, Playa De Los Pocillos, Lanzarote. Get More Information and claim your Free Child Place for Hyde Park Lane Bungalows, Playa De Los Pocillos, Lanzarote. Hotel Lanzarote Village, Playa De Los Pocillos, Lanzarote. Get More Information and claim your Free Child Place for Hotel Lanzarote Village, Playa De Los Pocillos, Lanzarote. Floresta Apartments, Playa De Los Pocillos, Lanzarote. Get More Information and claim your Free Child Place Floresta Apartments, Playa De Los Pocillos, Lanzarote. Relaxia Olivina, Playa De Los Pocillos, Lanzarote. Get More Information and claim your Free Child Place Relaxia Olivina, Playa De Los Pocillos, Lanzarote. Hotel Las Costas, Playa De Los Pocillos, Lanzarote. Get More Information and claim your Free Child Place Hotel Las Costas, Playa De Los Pocillos, Lanzarote. Free Child Places Cinco Plazas Apartments, Puerto Del Carmen, Lanzarote. 3 star. Get More Information and claim your Free Child Place. Free Child Places El Trebol, Costa Teguise, Lanzarote. 3 star. Free Child Places Family Life Flamingo Beach, Playa Blanca, Lanzarote 4 star. Free Child Places Be Live Experience Lanzarote Beach Hotel, Costa Teguise, Lanzarote 3 star plus. We found lots of great deals for family holidays in Lanzarote, without a Free Child Place with the total price (family of 4) for 7 nts All Inclusive from £1,922 (3 star hotels) to £2,858 (5 star hotels). All example prices shown below were based on flight plus hotel dep Newcastle 7th July. El Trebol, Costa Teguise, Lanzarote, 3 star, 7 nts All Inclusive from £1,922 (Total Price – family of 4). Los Ficus Apartments, Costa Teguise, Lanzarote, 3 star, 7 nts All Inclusive from £2,016 (Total Price – family of 4). Beatriz Playa Hotel, Matagorda, Lanzarote, 4 star, 7 nts All Inclusive from £2,130 (Total Price – family of 4). Paradise Island Hotel, Playa Blanca, Lanzarote, 4 star, 7 nts All Inclusive from £2,178 (Total Price – family of 4). Be Live Lanzarote Resort, Costa Teguise, Lanzarote, 4 star, 7 nts All Inclusive from £2,232 (Total Price – family of 4). Barcelo Lanzarote Resort, Costa Teguise, Lanzarote, 4 star, 7 nts All Inclusive from £2,240 (Total Price – family of 4). H10 Rubicon Palace, Playa Blanca, Lanzarote, 4 star, 7 nts All Inclusive from £2,384 (Total Price – family of 4). Hotel Sol Lanzarote, Matagorda, Lanzarote, 4 star, 7 nts All Inclusive from £2,396 (Total Price – family of 4). OLE Olivina Lanzarote, Puerto Del Carmen, Lanzarote, 4 star, 7 nts All Inclusive from £2,490 (Total Price – family of 4). Sandos Papagayo Beach Resort, Playa Blanca, Lanzarote, 3 star, 7 nts All Inclusive from £2,520 (Total Price – family of 4). BlueBay Lanzarote & Waterpark, Costa Teguise, Lanzarote, 3 star, 7 nts All Inclusive from £1931.72 (Total Price – family of 4). saving £600 against Tour Operator Price of £2,532. Mirador de Papagayo, Playa Blanca, Lanzarote, 3 star, 7 nts All Inclusive from £2,552 (Total Price – family of 4). SunConnect HD Beach Resort Aqua & Spa, Costa Teguise, Lanzarote, 4 star, 7 nts All Inclusive from £2,810 (Total Price – family of 4). Seaside Los Jameos Playa, Costa Teguise, Lanzarote, 5 star, 7 nts All Inclusive from £2,858 (Total Price – family of 4). Holiday Village Flamingo Beach (Playa Flamingo Apartments), Playa Blanca, Lanzarote, 4 star, 7 nts All Inclusive from £3,140 (Total Price – family of 4). Sandos Papagayo Beach Resort, Playa Blanca, Lanzarote, 4 star, 7 nts All Inclusive from £2,520 (Total Price – family of 4). Hotel H10 Rubicon Palace, Playa Blanca, Lanzarote, 4 star, 7 nts All Inclusive from £2,336 (Total Price – family of 4). Barcelo Lanzarote, Costa Teguise, Lanzarote, 4 star, 7 nts All Inclusive from £2,236 (Total Price – family of 4). Flamingo Beach Resort, Lanzarote, 3 star, 7 nts All Inclusive from £2,858 (Total Price – family of 4). Lanzasur Splash Resort, Playa Blanca, Lanzarote, 3 star, 7 nts All Inclusive from £2,884 (Total Price – family of 4). Be Live Family Lanzarote Resort, Costa Teguise, Lanzarote, 4 star, 7 nts All Inclusive from £2,308 (Total Price – family of 4). Be Live Experience Lanzarote Beach Hotel, Costa Teguise, Lanzarote, 4 star, 7 nts All Inclusive from £2,356 (Total Price – family of 4). Los Zocos Club Resort, Costa Teguise, Lanzarote, 3 star, 7 nts All Inclusive from £2,260 (Total Price – family of 4). ClubHotel Riu Paraiso Playa De Los Pocillos, Lanzarote Resort, Lanzarote, 4 star, 7 nts All Inclusive from £2,740 (Total Price – family of 4). Seaside Hotel Los Jameos Playa, Playa De Los Pocillos, Lanzarote, 4 star, 7 nts All Inclusive from £2,700 (Total Price – family of 4). Sol Lanzarote Aparthotel, Matagorda, Lanzarote, 3 star, 7 nts All Inclusive from £2,272 (Total Price – family of 4). Hotel Costa Calero, Puerto Calero, Lanzarote, 5 star, 7 nts All Inclusive from £2,608 (Total Price – family of 4). 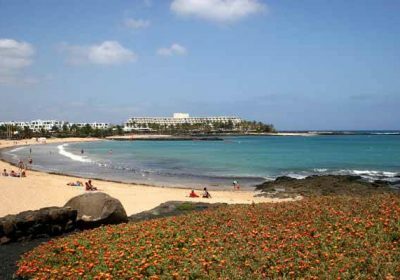 Hotel H10 Lanzarote Princess, Playa Blanca, Lanzarote, 4 star, 7 nts All Inclusive from £2,492 (Total Price – family of 4). Morromar Apartments Matagorda, Lanzarote, 3 star, 7 nts All Inclusive from £1,852 (Total Price – family of 4). THB Tropical Island (Sun Island Aparthotel) Playa Blanca, Lanzarote, 3 star, 7 nts All Inclusive from £2,048 (Total Price – family of 4). Caybeach Sun (Cay Sun Beach Hotel) Playa Blanca, Lanzarote, 3 star, 7 nts All Inclusive from £2,620 (Total Price – family of 4). Hipotels La Geria (La Geria Hotel) Puerto Del Carmen, Lanzarote, 3 star, 7 nts All Inclusive from £2,636 (Total Price – family of 4). Hotel Hesperia Playa Dorada Playa Blanca, Lanzarote, 3 star, 7 nts All Inclusive from £2,752 (Total Price – family of 4). Hesperia Lanzarote Puerto Calero, Lanzarote, 4 star, 7 nts All Inclusive from £3,628 (Total Price – family of 4).